I mentioned last week that I “feel a post about the deficit coming on.” Which makes it sound a little bit like a bowel movement. Perhaps that’s a valid comparison. Certainly it’s a subject that affects our lives a lot more than we would like to admit, but also rarely discussed in polite society. Finally, if things get out of whack, there can be disastrous consequences. I don’t recall specifically thinking about this at the time, but I’m sure the news that the national debt recently passed 20 trillion dollars had to play a part in my desire to write about it now. Perhaps you also heard the news that the national debt had passed $20 trillion, but it’s equally probable that you didn’t. It didn’t appear to be very big news, at least from my perspective. Certainly people mentioned it, but I think the news was dominated by Irma and as usual, i.e. Trump. As I said, it’s possible that it was just me, but in an effort to find a more objective source I stumbled onto the Vanderbilt Television News Archive. Searching a period from September 11th (I’m sure that’s part of the problem) to today (October 20th) There were zero stories which mentioned the “deficit”, 4 stories which mentioned “debt” (and none of them actually appear to be talking about the national debt) versus 109 stories which mentioned the word “hurricane” and 190 stories which mention Trump. Leading me to conclude it wasn’t just unremarked on from my perspective. I do understand that $20 trillion is somewhat arbitrary, and it would be difficult to make the case that somehow $20 trillion is qualitatively different than $19.5 trillion. Still they’re both staggering numbers, high enough to deserve some comment, I would think, even if we hadn’t passed a major (albeit somewhat arbitrary) milestone. My go to source for the a snapshot of the problem and all its facets is the US Debt Clock, which is equal parts illuminating and frightening. As of this writing the debt, stands at $20.424 trillion (meaning we’re closing in on halfway to our next trillion.) The debt clock helpfully translates this into more easily understandable numbers and tells us that this equates to a debt of $63,646 per citizen and $169,251 per taxpayer. I would hazard to predict that most people start worrying when they hear these numbers, but it’s most likely a directionless worry. What can the average citizen do about a $20 trillion dollar or even a $63k of debt? Of course there are people whose job it is to worry about these sorts of things and to offer advice about what should be done. This includes people with direct responsibility like those who actually work at the Treasury Department, but I would also extend it to include people outside the system, like economics professors and newspaper columnists. And many, if not most, of these people, the most notable of which is Paul Krugman, contend that there’s really nothing to worry about. Why aren’t they concerned? Well, if you look into it you’ll come across a few different reasons for this. I’ll provide a brief overview of several of them, though this list is not comprehensive. And then later I’ll look at why, despite these reassurances, we might still need to worry. Krugman also points out (from the same article) is that, unlike individual debt, which is money we owe to someone else. The national debt is money we owe to ourselves. Just to be clear this is true for the majority of the money, but there’s still $6 trillion dollars which is owed to foreign investors. When you compare the debt to the national GDP, and compare the US’s indebtedness to other countries it’s not that bad. The US is only number 8 in terms of indebtedness, and based on debt as a percentage of GDP, we’re only half as bad as the #1 country, Japan. (Over 100% vs. well over 200%.) And Japan is doing okay, meaning presumably we have a long way to go before we have to worry. Borrowing money is currently a very good deal. Ever since the financial crash the interest rate the government has to pay to borrow has been extremely low. To once again use the analogy of a typical consumer, sure it’s stupid to borrow money on a credit card that charges 18%, but borrowing money at 1.5%, particularly if you could find a way to reinvest it at 5% would be a great deal. Our debt is in dollars, and we can print dollars. One person compared defaulting on our debt to the difficulty of starving to death in a warehouse full of food. It’d be possible, but not very likely. Our assets greatly exceed our liabilities. The US government owns buildings, land, infrastructure, and some exceptionally valuable nuclear missiles. Our debt may be a huge negative value, but our net worth is an even huger positive value. Those are a selection of the most common reasons the experts give for not worrying about the national debt or the current deficit. I may have missed one or two, but I think I got all the big ones. And now, if you’re anything like most people you may be torn between the gigantic size of the debt, and your long standing belief that debt is bad, on the one hand and the “experts” telling you, on the other hand, not to worry about it. Unless this is the very first post of mine that you’re reading, you can probably guess that I think the debt, and the ongoing deficit, are problems. Problems we should be worried about. That being the case, what would I say in response to the six reasons listed above urging me and everyone else not to worry? 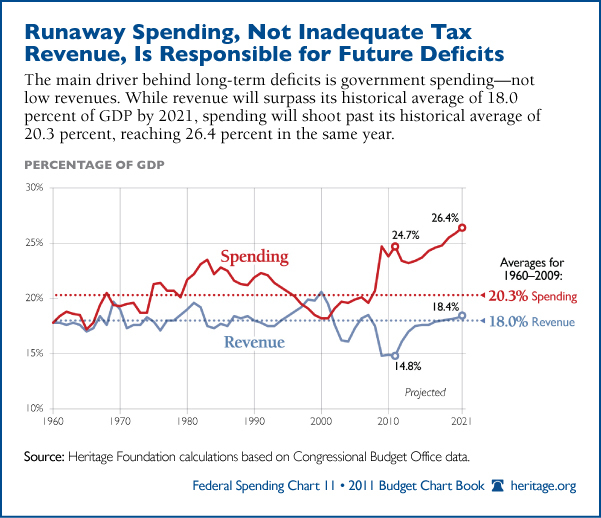 Krugman says that we just have to ensure that the debt grows more slowly than the tax base. I agree, but I don’t see any evidence that this is happening. The government consistently spends about 18% more than it takes in, and most future projections show that this will only get worse. I’ll have a lot more to say about this point. I also understand that this is money we owe to ourselves, but that doesn’t make it frictionless. It’s not like when my wife owes me $20, but really she doesn’t, because we have a joint checking account. This joint ownership has significantly more players involved, with significantly less affection. As a thought experiment, imagine the US reneging on the domestic portion of the debt with a cheery, “Well it was all money we owed ourselves!” And see if, afterwards, anyone is still making that argument from the smoking ruins of Washington DC. I agree that other countries have it worse. And perhaps as long as Japan is fine we can confidently continue on our course, but just because Japan is fine now (though there’s argument even with that) doesn’t mean they’ll be fine forever, nor does it even mean that we’ll be fine until we hit the same level as Japan. Japan is one data point, and not even a very good comparison to the US, given the vast differences. Yes, interest rates are currently low, but it’s not as if there’s some method whereby the minute they go up we pay off the $20 trillion dollars and go back to being financially prudent. Rather we still have that debt (and probably a lot more) and we start to have to pay the higher rate of interest, which takes up an increasing percentage of the total budget. Federal debt isn’t a 30 year fixed rate mortgage it’s an adjustable rate mortgage that lasts forever. It is true that our debt is denominated in money we can print, but that doesn’t mean that printing money is free of consequences. You may have heard of a little thing called inflation? I suppose this technically does mean we can’t default on our debt, but that doesn’t mean bad things can’t happen and that we shouldn’t be worried. Finally, getting back to friction, we do have vast assets, but how liquid are those assets? If it comes to it, who’s got the money to really buy an aircraft carrier? I’m sure China would, but that’s a situation where the cure is worse than the disease. People like Krugman make a lot of noise about how you can’t compare household debt to government debt, and in this case, you can’t compare household assets to government assets. There is no ebay for the Pentagon. At this point we have a bunch of clever reasons not to worry about the deficit and a bunch of clever responses for why we still should. And if asked to choose between the cleverness of a Nobel Prize winner like Krugman and my cleverness, or what I’m attempting to pass off as cleverness, it’s perfectly reasonable to want to choose the Nobel Prize winner over me. But before you do that, there are some additional things for you to consider. First there is no true cleverness here or on the other side. No one really knows anything. Having a debt of $20 trillion dollars is so far outside of the range of normal human and historical experience that neither the expert’s reasons for calm, nor my responses are based on anything actually resembling data. This is not to say people haven’t tried. As I mentioned above, when you compare the US to Japan our debt as a percentage of GDP looks pretty good. But how strong is this comparison? Well, by the normal standards of scientific rigor it’s really, really weak. On the other side of things Reinhart and Rogoff released a study which showed once your debt to GDP ratio got over 90% that economic growth slowed. This at least was more than a one to one comparison between the US and Japan, but it also had some problems, not the least of which was the lack of real data. In other words, it doesn’t matter what side you’re on, we’re definitely in uncharted territory. Which is fine, if the consequences for being wrong are small, but the consequences for being wrong are not small, the chances of being wrong may be small, but the consequences of being wrong definitely aren’t. (And I don’t think the chances of being wrong are especially small either.) The US Government Bond market represents a single point of failure, and if it fails, it would be catastrophic in ways you could hardly imagine. All of which takes us to a point I make again and again, certain risks are so great that even if the probability is low, making sacrifices to prevent that catastrophe are not only warranted but wise. And while I agree that in the short term the danger is pretty low, no one is sure what the endgame is going to be, and that’s where I’d like to turn now. To begin with, let’s return to Krugman’s assertion. That debt just needs to grow more slowly than the tax base. Once again, I agree, but this last happened around the year 2000, and it was a tiny blip even then. 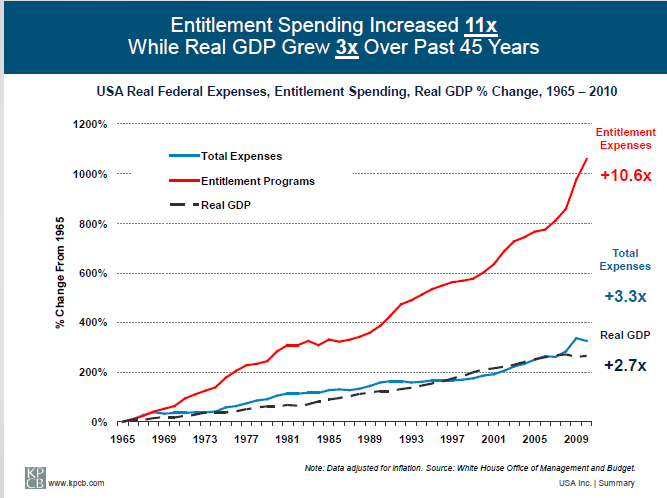 I don’t see any reason to suspect it’s going to happen again, certainly not in the foreseeable future, particularly when you consider the enormous, and increasing cost of the entitlement programs. Thus even if we grant that a certain amount of debt is okay and maybe even beneficial, I don’t think anyone believes that we can take on infinite debt. But if debt continues to grow faster than taxes, something is going to have to give. That might not even happen until debt is 1000% of GDP, but regardless, as long as debt grows faster than taxes something will have to change. So what are the options? Given that it’s worked so far, let’s turn to another list of six items. This time a list of options. Grow our way out of debt: As I have already mentioned this is the ideal way to deal with debt. But as I have also pointed out it doesn’t seem very likely to happen. Since 1967 the debt has grown at an average rate of 8.65%, while GDP has grown at an average rate of 2.85% during that same period. Increasing the tax rate can overcome some of this gap, but that will only take you so far. (See Option 3) Also if anything growth appears to be slowing while the budget (particularly mandatory spending) just keeps getting bigger. Again I agree with Krugman that as long as our growth keeps up with our debt, we probably have bigger things to worry about, but I don’t see the slightest evidence that this is happening. Cut Spending: Obviously this is where all the arguments are taking place. Though despite all the Sturm und Drang over entitlement cuts and the revocation of Obamacare, I haven’t seen much evidence that anything like this is going to happen. And if you look at the amount that would have to be cut, it’s frankly ridiculous. Imagine that you wanted to get the debt down to 50% of GDP within the next 20 years. Assume that the economy grows at 3% per year without a recession. (Which is extremely optimistic.) Our current GDP is around $18.5 trillion, so in 20 years it would be $33.5 trillion, meaning 50% is $16.75 trillion. That’s $3.25 trillion dollars less than our current deficit, meaning we’d have to not only balance the budget, we’d have to be 162 billion dollars under budget on average, every year for 20 years. In the recent history that did happen from 1999-2001. But 3 years in a row is a lot different than 20 years in a row, particularly given that in less than 20 years, according to the Congressional Budget Office projections, entitlements and interest are expected to consume 100% of revenues. Finally, even if we assume that the right mix of politicians could do this, how would they ever get elected? Raise Taxes: Obviously these first three options are all closely related, and, to me, they all appear extremely unlikely, though I know that some people feel that raising taxes would be the easiest of the three. That said it’s not as straightforward as people think. There’s a functional limit to how much you can extract both practically and politically in taxes, and the tax rate has less to do with it than you think. Look at this graph and observe how despite the top marginal rate being all over the place (at one point as high as 90%) the actual revenue collected since World War II, as a percentage, has barely budged. And as I mentioned, there’s very good reason to believe that growth is slowing, and when that’s combined with increased spending, which is already locked in by law, the tax increases would be pretty staggering. In the near term 50% is not out of the question, and in the long term, if trends continue as they have, you could be looking at having to double tax revenue. If you thought it was hard to get elected by promising to cut the deficit, imagine how hard it would be if you promised to double taxes. Inflate the debt away: From 2008 to 2009 Zimbabwe entered a period of hyperinflation. The numbers are astonishing, and almost hard to grasp (how often do you hear someone use the term “sextillion percent”?) But one illustrative example is that at the beginning of things they were printing 10 dollar Zimbabwean Bills, and by the end they were printing 100 billion dollar Zimbabwean Bills. Meaning, if the same thing happened to the US, you might be able to pay the entire debt off with the equivalent of 2,000 pre-hyperinflation dollars (presumably in gold or something like that). This is a particularly extreme example, and I’m not suggesting that’s what will happen in the US, if it did the cure would be much worse than the disease. The question is, is there some less extreme version of this? There might be, but I’ve never seen a good explanation of how it might work. But at a minimum if the gap between debt growth and GDP growth continues at 5.8% (see figures in option 1) then inflation would have to be at least that much, and that assumes that the debt doesn’t start growing faster, but it almost certainly would since much of spending is indexed to inflation, and even the stuff that isn’t indexed to inflation would still be influenced by it. Default on the debt: Given that this is precisely the cataclysm we want to avoid, I don’t think it’s an option anyone would choose voluntarily. But it is an option, and definitely the option that is mostly likely to happen without warning and without any planning, and perhaps without even much advance warning. Needless to say while most people acknowledge this it’s a possibility, no one wants to discuss it. And to use a quote from Douglas Adams: “The major difference between a thing that might go wrong and a thing that cannot possibly go wrong is that when a thing that cannot possibly go wrong goes wrong it usually turns out to be impossible to get at or repair.” I’ve already linked to people who say we can’t possible default on our debt. I hope they’re right, but consider that there have been all manner of things which cannot possibly go wrong, but have gone wrong despite this. A singularity: Long time readers of this blog were probably wondering when this was coming. And for those that are just joining us. Here I refer to something that changes the rules in such a way that none of the previous assumptions are valid. In this case it would probably have to be something big enough that it eliminated the need for money all together. A nanotechnology manufacturing revolution which creates a post-scarcity society. Brain digitization into a virtual world where nothing costs anything because it’s digital. Something of that nature. Of course, what this amounts to in essence, is hoping for a miracle. Or at the very least they’re hoping that something will come along in the future and fix it. A more accurate name for this is kicking the can down the road. I don’t think most of the people telling us not to worry about the debt will actually come out and say they’re advocating kicking the can down the road, but if they’re not, which of the other solutions I listed above are they proposing? I honestly don’t know. There are people who argue that we don’t need to worry about the debt, but they mostly seem to be arguing that we don’t need to worry about it right now. Primarily because the US can still borrow very cheaply and there’s no sign of that anyone is losing trust in our ability to repay the debt. That does appear to be true, for now. The question no one knows the answer to, regardless of what they claim, is how long that will last. The national debt is a giant source of fragility. And the best plan for dealing with it seems to be “ignore it and hope something comes along later to solve it.” Which takes us back to a theme I’ve been emphasizing since the beginning, we’re in a race between singularity and catastrophe. And as far as the national debt goes, I think catastrophe has a sizable lead. The Federal Government needs an enormous amount of money to run, you know who doesn’t need an enormous amount of money? Me. In fact I’d be happy with a buck a month. If you enjoy this blog and can spare it, consider donating. 1. Perfectly stated! "All we have to do to stay solvent is something we never do" is an argument AGAINST doing that thing. 2. I've never understood this argument. If Uncle Sam is unable to repay a loan borrowed from a Toyota dealer, and the dealer goes out of business, does it matter LESS if the dealer is in Ohio than China? 3. What happened to Japan? It's not well-enough appreciated that they were a nation that - before they started racking up massive amounts of debt - rivaled the US in economic output, and was on pace to exceeding US GDP in the 1990's. Correlation is not causation, but Japan is not a nation to try to emulate for their national economic strategy. 4. Combined with point #1 is insanity. If you simultaneously argue that nations can continuously renew their debt, and that borrowing is currently at a low rate you've outsmarted yourself. We increase the total debt burden based on low interest rates TODAY, knowing that: 1. Future interest rates will rise, and 2. We will maintain all new debt once that happens. This sounds more like post-hoc rationalization to avoid undesirable outcomes than it does a rational economic strategy. For example, let's say I'm selling you an EcoWidget. Its cost is that you take out an interest-only loan for $100 at 1.5% interest at an adjustable rate FOREVER. In return, EcoWidget will provide you a return on your investment of 5% for 2 years. Then I call that a good deal to you, and you agree because, "we can afford 1.5% right now"? 5. I wonder how long the US dollar will continue to be the world reserve currency if we abuse the privilege. I know many countries are trying to find alternatives - including cryptocurrency - but there's nothing right now that beats the dollar. Mostly, this is because things like Bitcoin are too new and other governments too unstable to build financial systems on. Is it really our economic strategy to maintain the dollar as the world currency by being the least-bad of all available options? Is that even close to a long-term strategy? What economist seriously argues this? 6. Irrelevant. As you noted, we cannot reasonably liquidate our national assets and if we tried we wouldn’t get ‘market value’ for them. This whole argument is no different to telling a homeowner in January of 2007 that it's okay he owes a huge amount of money on his interest-only ARM loan. He can ALWAYS refinance, because his house is worth more than his loan. And yes, lenders said exactly that to homeowners in 2007. They were wrong about the basic economics of debt then, and they're wrong today. But more importantly, this way of thinking is wrong about what produces prosperity. A few years back, Thomas Picketty published Capital in the 21st Century. The book created a firestorm, and people are still debating the implications of his findings, but one thing nobody seems to be talking about is this rather pedantic finding: Capital makes you more wealthy over time by producing a greater return than inflation. Poor people don't accumulate capital, while rich people do. The way I see it, you have two mindsets: people like Krugman arguing prosperity through debt against all empirical evidence, versus a strategy to accumulate capital to gain long-term wealth. Poverty mindset, versus prosperity mindset. 3- The fact that Japan was on track to pass the US GDP is something I had forgotten. That is an excellent point in favor of the problems their debt to GDP ratio has caused. 4- Agreed. Though, incredibly this does seem to one of Krugman and companies favorite arguments. The interest rate is low, there's no downside to borrowing!! 5- Cryptocurrency is very interesting. You can have a catastrophe and a singularity at the same time. Crypto creates some kind of financial singularity which not only gets rid of the US as the reserve currency, but undermines the need for the dollar, which is one of the main things propping the whole edifice up. And you also bring up a longer time horizon, which is I think what most people completely overlook. I think your homeowner argument is exactly on point, as is the point that the crisis could come from something outside of the US. I think people are very narrowly focused on a few metrics, like the low interest rate without considering that if something is fragile (like the debt) it will eventually break even if it's not apparent how. Exactly. And the point isn't to predict the precise date or mode of collapse. And I know your post is focused on fat-tailed, loaded-risk events, but I think it's important to go one step past just saying "let's not bet our entire financial system's solvency on a historically likely scenario NOT happening". Sure, that's an important - THE important - point. But my sense is that to people coming from the crazy side of the argument it gets lost as maybe just some good points from one side of a larger debate, and "Okay sure, but maybe Krugman et. al, have a good rebuttal!" Thus it's not sufficient, I think, to just demolish the absurd arguments themselves. (Don't get me wrong, though, it's entirely necessary!) Because those arguments are, in the end, ad-hoc justifications for the status quo. The next academic-turned-political-hack will always be able to create more vacuous arguments to support wishful thinking. And people will always WANT to believe it, because it's easier. Thus, an important step to convincing those who are not already convinced is to provide an alternate vision. One where we show that the best evidence - from Leftist, no less! - demonstrates that people and nations who continuously rely on debt to fund themselves from crisis to crisis never achieve prosperity. What if politicians imagined the things they could do with the quarter trillion dollars we currently spend on the debt? What if we talked about investing in our children with a plan that is guaranteed to redound to their benefit years down the road? (And had an honest conversation about how horribly our former "investments" turned out from an ROI perspective.) I like the Push-Pull combination of "the current debt is insane and based on confounding arguments" with "we have a real financial strategy of building national wealth instead of giving it all away". You do make a powerful case about providing an alternative vision, and that's always been one of my weak points. I think the key problem with the vision you describe is before we can craft a vision for what we do with the money we save on debt servicing, we have to go through a very painful period of pain down the debt first. And sacrificing things in the present for a better future, is the key to civilization period, but also something we're particularly bad at right at the moment. The growth argument is dramatically underrated. Healthcare is maybe 17% of the US economy, let's round to 20% which it will almost certainly hit within our lifetimes (unless we have an unexpected accident very soon). So what happens if you have a piece of something that is growing at, say, 5% while the other pieces grow at, say, 0%? Well overall growth will be 20% of 5% or 1%. What happens if it is 50% of the total but still growing at 5%? Well overall growth will go to 2.5% (5% of the half and 0% of the other half). What if the entire thing becomes that one element growing at 5%? The whole then grows at 5%. Math. Here's the problem dismissing growth. Let's say debt is growing due to health care costs. Health becomes a larger share of the economy. Health's growth rate is higher so the rest of the economy's growth rate must pick up. 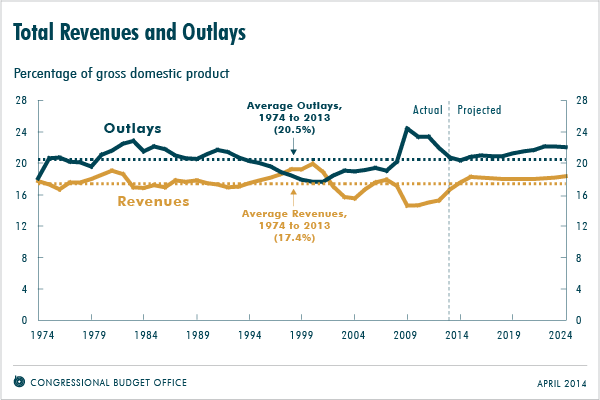 If the overall economy grows faster, gov't revenue goes up and spending goes down. What if health stops growing so fast? Gov't spending goes down since health is dominating gov't spending growth. In fact if you have a really huge economy that borrows in its own currency I suspect it's impossible to really get a debt problem. You will get an investment and inflation problem if huge gov't borrowing drives a boom the economy cannot keep pace with but the debt itself is not a problem. WWII is a good example of this. Ultimately the gov't was spending more than GDP and the economy struggled to keep up. Prices were held in check by forced savings...on the home front people had plenty of jobs and money but rationing made it hard to spend that money, pressure was on to buy war bonds and many high end things like new cars were impossible to buy since all the auto manufacturers retooled to make military goods. Why didn't the debt become a problem when the war ended and people wanted to cash in those bonds for spending? Well first you can't 'cash in bonds', you can sell them to someone else but they don't turn into cash until they mature. But more fundamentally map out what happens if someone has a load of maturing war bonds and they go down to buy a new car. They buy the car, the car dealership makes money. The car dealers either wants to save that income or spend it. If he saves the gov't can turn over the debt by selling him a new bond. If he spends he pushes income to someone else which sets off the same dynamic. The gov't either has a new influx of savers who will turn over expiring bonds or it has a surge of economic growth that slashes the demand for gov't spending while tax revenue surges. If the US national debt presents a serious risk what accounts for long term interest rates remaining low? I know your views are more nuanced than this, but surely you can see that people can be wrong about the risk. We had a great example of that in 2007. Someone might easily have asked, "If subprime mortgages present such a serious risk, why are they so easy to get, why are more people clamoring to enter the market? The US Treasury market is huge. It is larger than the stock market, larger than mortgage bonds, it is absolutely huge. In terms of an analogy, the subprime mortgage bubble is like talking about ocean front property in this or that spot while US Treasuries themselves are the ocean. So strike one against the theory that US Treasuries are just in a bubble is that it would have to be a bubble consisting of almost the entire world, from companies with cash hordes to oil sheiks to Chinese corporations with surpluses. Strike two, the bubble would have to be remarkably stable. Fretting about the deficit size was earnest back in the 1984 election. We've gone over 30 years wondering if the national debt was a massive problem. People would have lived nearly their entire working lives under this 'bubble'. Is there any example in history of a long lived bubble such as this? Strike three, popping dynamics. What happens when a bubble pops is those who would have normally been comfortable with purchasing bubble assets at higher and higher prices suddenly get spooked, realize how silly the whole thing is, and run to safety. When the mortgage bubble popped, for example, interest rates dropped like a rock and even went negative briefly because money ran into US Treasuries, Eurobonds, Japanese bonds...basically low risk asset. Let's try to imagine how a 'pop' in the Treasury market would work. Each week or so the Treasury conducts auctions (see https://www.treasurydirect.gov/instit/annceresult/annceresult.htm) of new bonds. The price of the winning bid sets the interest rate for that particular bond. Existing bonds of various maturities are traded constantly in the 2ndary market where price changes create different interest rates for different years until maturity (also called the yield curve). A collapse of the bond market would mean investors would refuse to buy new bonds except at a very low price which would result in a massive interest rate hike, in the 2ndary market those holding bonds would discover that they couldn't sell for a price that wasn't much lower. Which then causes me to ask 'and then what'? Funny thing, why are so many people holding bonds to begin with? Well if you're like me you struggle to keep money in your wallet. This has gotten a bit easier as I get older but in general I feel like I have less rather than more money and between paychecks I try to keep the money going out slower than it is coming in. On the other end of things, all those dollars that make it out of your wallet actually become the opposite problem for the guy on the other end. Big companies, banks, funds, etc. have treasury departments whose job it is to figure out what to do with billions of dollars that roll in each month. The answer is not as simple as just put it in the bank. This is why every month billions of dollars of Treasury bonds get bid on at auction and inbetween trillions of them trade back and forth. So if they are not going to buy bonds because 'the bubble burst', what exactly are they intending to do with that cash? I'm not seeing anything else that wouldn't cause a massive surge of economic growth which would solve the 'debt problem' in its own way. I wasn't saying it was a bubble, though it certainly might be. It turns out that if you start looking into the definition of a bubble they are mostly identified only after the fact. My point was more about how investor sentiment (in this case low long-term interest rates) has proven to be a poor gage of actual risk. Investors and experts are wrong all the time. All of this was in response to your initial question, "If the US national debt presents a serious risk what accounts for long term interest rates remaining low?" There are plenty of examples historically where the risk, as reflected in interest rates, was wildly off from the actual risk. But you did bring up one great point, how huge the US Treasury market is, and it is precisely it's overwhelming size which makes the risk of being wrong so catastrophic. And when you look at all the times people were wrong about all aspects of the future, I think the risk of being wrong about the debt is significant. A few interesting differences. One is the length of time, if this is a bubble people have lived their entire adult lives in it (let's say serious national debt concern might be traced back to 1980 or so, we're heading on for 40 years here) and at least two generations of working lives in it. I don't think you can identify any other such bubble in history. Whether you're talking Enron, tulips or MBO's, there has always been an inverse relation to size and length of the bubble. Size is also an argument against it. Line Ponzi schemes, bubbles burn out faster the larger they are. Even things like the MBO's and real estate bubble had actually a few players in it. Few people and even companies did anything directly with MBO's. Those who saw their home values zoom up were more like seeing a side effect rather than participating in the bubble. Treasuries, however, are quite different, if you use money you're using Treasuries. So I think we have a good argument against a bubble here. If it is, it is like no other bubble ever seen which implies it isn't a bubble. Your question is whether it may be a case of people 'being wrong', even if not necessarily deluded by a bubble. So at its base what is the thing going on here that is wrong? People who could spend money are buying Treasuries. If they don't, what are they going to do? I can't really see any answer that is not either they spend their money or they buy some other type of investment product but either choice ends up kicking the can back to Treasuries. If you buy bitcoins, you are paying someone dollars for them that you would have brought Treasuries with. What are they doing? Not buying bitcoin (they just sold to you!). If you buy canned food and concrete to build your bomb shelter, well at the end of the day Home Depot is buying Treasuries with your money or they are paying employees to ship stuff to your house and paying taxes to the Treasury. Fine grained here there's a lot of ways to be wrong, coarse grained it's almost impossible. Coarse grained, gravity tells me if there's a massive earthquake my house will collapse into a pile of rubble...fine grained I probably can't predict very well if the photo albums will end up at the top or bottom of the pile. I think we should also look at your list in the spirit of analyzing this in terms of are we talking about actual consumption or just changing around who owns what paper assets? 1. Growth: Something unspoken, GDP is not the gov't's income. The analogy you are working with here is something like "If my debt goes up 5% per year but I'm getting 10% raises every year I'm actually in a better position". But since we are not in a socialist economy, GDP going up doesn't automatically accrue to the gov't. It indirectly helps since higher GDP means people are paying more taxes, collecting less unemployment etc. It also means a potential tax increase places a smaller burden on the economy but there still isn't a straight shot from 100% of debt to GDP to a 100% tax to just pay off the entire debt in one big gulp. GDP is not important because it is an analogy to your salary, it is important because the problem of debt is how much people want to consume. Higher GDP means the economy can accomodate more consumption than less. 2. Cutting spending: https://fred.stlouisfed.org/series/FYONGDA188S Federal spending has been remarkably stable. It's about 20% of GDP. If gov't could spend 20% of GDP since about 1955 and during that time we went to the moon, built interstate highways, and enjoyed a host of fun consumer innovations ranging from pop tarts to iphones, why would the same level of spending going forward be an issue? 3. 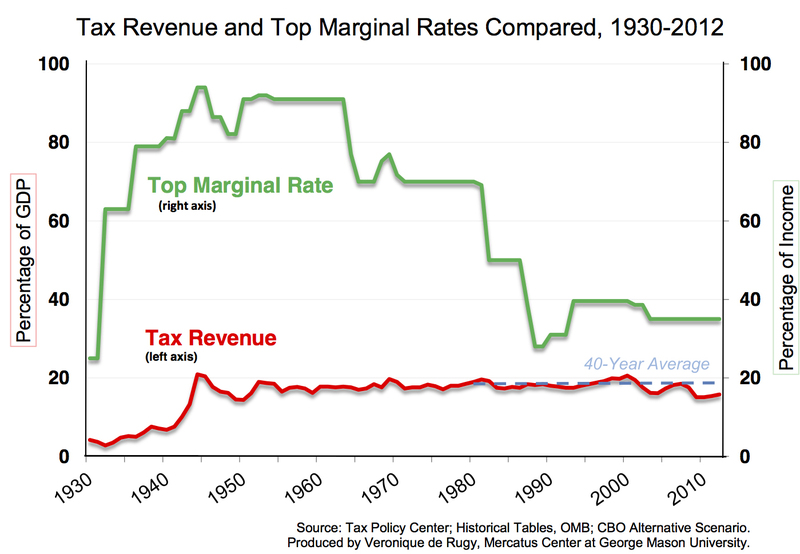 Raise taxes: https://fred.stlouisfed.org/series/FYFRGDA188S taxes are remarkably stable since 1955 or so as well. They hover between 15% and 17.5% of GDP. So we've been borrowing between 2.5% and 5% of GDP each year since about 1955. Let's hold there for a moment. It seems remarkable that despite huge political fights over military buildups, the expansion of Medicare, the war on poverty, and back and forth on taxing the rich versus supply side Republicans that we are so even when we take a coarse grained % of GDP view. It also seems interesting that the difference between taxing and spending seems like the mirror image of economic growth and possibly our savings rate. In biology there's the concept of homeostasis....some aspects of your body remain roughly the same despite your body being in radically different states. For example, your body temp holds around 98 degrees even though you have all different levels of activity, sometimes you're in a cold place, sometimes a hot place. When we see stability like the above that hints to me that a metric like the deficit over the long run is generated not so much by our political decisions but by the dynamics of the economy itself. 4. Inflate the debt: So why Zimbabwe and 'sextillion percent' inflation? I mean the debt is 100% of GDP or so, so if the gov't printed $100 bills equal to 100% of GDP, purchased all the Treasury bonds and everyone ran out to spend that money you would get 100% inflation one time. That would be pretty dramatic but it's one time and afterwards we have zero debt. It's also pretty radical, I mean did you pay off your mortgage in a single year (assuming you didn't win the lottery or have some huge, unusual windfall)? If we did 10% inflation one year with four years off then repeat, we would knock down the debt rapidly but have inflation that we would have envied in the 70's. BUT this assumes everyone who turns in their Treasury bond for dollars would run out and buy stuff. Keep in mind I asked before why do people hold Treasuries? They hold Treasuries because they don't want to spend money they have today, they want to bank it for tomorrow. If the gov't printed $20T in $500 bills and gave it to bond holders and the bond holders stuff the bills in their matresses and keep them there, there would be absolutely no inflation. How do I know that? Because it already happened. http://tradeproacademy.com/the-fed-balance-sheet-unwind-explained/ Between 2007 and 2014 the Federal Reserve's balance sheet went from just under $1T to about $4.4T. How does that happen? They 'print' $3.4T and used it to buy up bonds of various types. Where did the inflation go? The people that sold the bonds stashed the 'printed' bills in their virtual mattresses. 5. Default: Not seeing the need here but going back to homeostatis...what would happen if someone said something like "it takes a lot of calories to maintain 98 degrees, why don't I experiment with drugs to lower my temp to around 75 degrees? ". The result would likely be to take a system that works and put yourself into a coma and death for no particular gain. 6. Singularity: Already happened once, in a way. WWII's debt was nearly the size of the entire economy whereas today it is barely 1% of the economy. Since we never paid off our debt after WWII, just rolled it over, we essentially had a singularity and WWII debt, as massive as it was, is now barely a blip. The actual Singularity presumably would happen even faster and be more dramatic than the 50+ years of growth and innovation since WWII, but let's just say the next 50 years is only half as impressive. Our debt today would be like 2% of GDP? Side note. Dutch company just sold off some bonds that have a 1,000 year maturity date (http://www.businessinsider.com/danish-energy-company-1000-year-bond-2017-11) The only reason they even bothered to give a maturity date is Danish tax law requires bonds to have some end date, but puts no limit on how far in the future that may be. I think this illustrates that what we call debt on the individual level is not really the same thing on a maco-economic level. You as an individual have a finite life so you are expected to pay back what you borrow. Investors make loans to you for things of finite lifespan (a new car from your auto finance company, your home from your mortgage, Christmas gift loan from your uncle Charley) hence they expect to get paid back at a certain near future point. Reality is on a macro level debt is not really about getting paid back, it is about jumping in and out of an income stream. I put $100,000 into some vehicle and it generates $2K per year. If I'm something without mortality, like a college endowment, I can leave it there forever. If I'm something with mortality, like myself, I can park it there for a few decades and then sell the stream to someone else when I want to retire. Preferred stock is essentially the same concept. You buy shares of preferred stock that pay fixed dividends (they can change the dividend but not easily). Unless you're buying them in the initial offering, you don't pay the company for them but pay someone else who wants to get out of them at the same time you want to get in. You normally have no expectation or right to ever get 'cashed out' of the stock by the company...just be able to sell your stock to someone else when the time comes. Economically a company with a lot of preferred stock is identical to one with a lot of debt. Practically debt on the macroscale is the same as preferred stock. The bonds mature but they are almost always paid off by issuing new bonds to investors who want in. You might as well ditch the maturing aspect and just have income streams. Economically then the 'national debt' is more like a tax placed on government spending by the investment class rather than the taxpaying class. Note this also resolves almost all of your possible crises points. If the gov't debt has no maturity, there is no crises where the debt suddenly needs to be paid off but the gov't can't issue new bonds. At worst what could happen is investors refuse to finance new deficits simply forcing the current budget into balance but not requiring massive efforts to pay off bondholders for previous deficits. Of course 'forever' bonds can get paid off. A government or company that wants to reduce outstanding bonds could simply purchase them from the market thereby taking them out of the equation and eliminating their 'forever' payment obligation.